on a single subject matter. Its continuing characters included policemen, private detectives, even humorous fillers, all built around the theme of detecting criminals and bringing them to justice. As superheroes proliferated throughout the comic book medium, detectives within that genre were added to the mix — first The Crimson Avenger, then Batman, and from that point on they dominated Detective Comics just as they dominated the industry as a whole. In the 60th issue (February, 1942), crusading district attorney Steve Malone, who'd been occupying a half dozen of the back pages for the past couple of years, was replaced with crusading district attorney Larry Jordan. The main difference was, the new guy was also a superhero called Air Wave. Larry Jordan had put on the costume and started fighting crime on a second front for the same reason The Black Hood, The Guardian and The Blue Beetle, all police officers in their everyday identities, did. He didn't like the slow, unreliable way the law dealt with criminals, i.e., the Constitutionally-mandated due process that had to be undergone before getting them off the street. Apparently, none of those guys were great fans of fair trials, individual rights and the presumption of innocence. In addition to putting on a gaudy, green costume, including mask, Larry invented a helmet that enabled him to receive electronic communications (radio or telephone), and a pair of skates that enabled him to slide at high speed along outdoor phone wires. Later, he added magnetic boots to enable him to climb walls (which apparently didn't conflict with the phone line skates), and the ability to enter into the electronic conversations he started out only listening to. He also had a pet parrot named Static, who was about as useful as Dr. Mid-Nite's owl, Hooty. Air Wave was probably created by writer Murray Boltinoff, who later worked as a major editor at DC, guiding the fate of The Doom Patrol, Super Hip and many others, but it isn't known for sure that he wrote the first story. The artist was Harris Levy, using the name "Lee Harris", whose other work at DC includes Lando, Man of Magic. The creative personnel lasted about a year, after which Joe Samachson (Tomahawk, J'onn J'onzz) and George Roussos (later a colorist at Marvel) took over. Levy returned to the character a few years later. Air Wave never made it onto a cover, had a crossover with another character, or appeared outside Detective Comics, but he did remain in the back pages there (usually at six pages per story) until the July, 1948 issue (#137). After that, he was replaced by Robotman, who had just been squeezed out of Star Spangled Comics. Air Wave wasn't heard from again until Green Lantern #100 (January, 1978), when the title character and his partner of the time, Green Arrow, met Air Wave's son, who happened to have the same name as Green Lantern — Hal Jordan. It seems Larry and the grown-up Hal were cousins (superhero universes tend to be small that way), and Larry had named his son after the same common ancestor that had been the older Hal's namesake. Larry had died in the interim, leaving his helmet, skates, etc. to young Hal, who had used them to become the new Air Wave. The story of his death, inflicted by one of his old enemies, was belatedly told in DC Comics Presents #40 (December, 1981). Death didn't keep Air Wave from appearing with The All Star Squadron once or twice during the 1980s, since that series was set back in World War II. 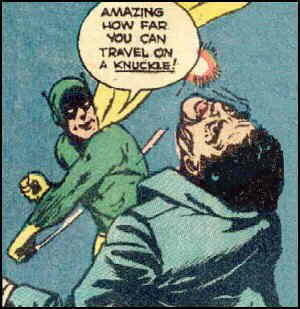 But just as he'd been a very minor character in Detective Comics, he was a very minor member of the very large team. Since the Squadron folded, the original Air Wave hasn't been used at all. Text ©2005-07 Donald D. Markstein. Art © DC Comics.